Jalen Tate (11) and Zaynah Robinson (5) guars a UNC Asheville player. The Norse defense forced 27 turnovers on the night. The Norse opened its KEMI Northern Kentucky Basketball Classic by defeating the Bulldogs 77-50 on Friday night. With the victory, the Norse remain undefeated (4-0) while the Bulldogs drop to 1-2. 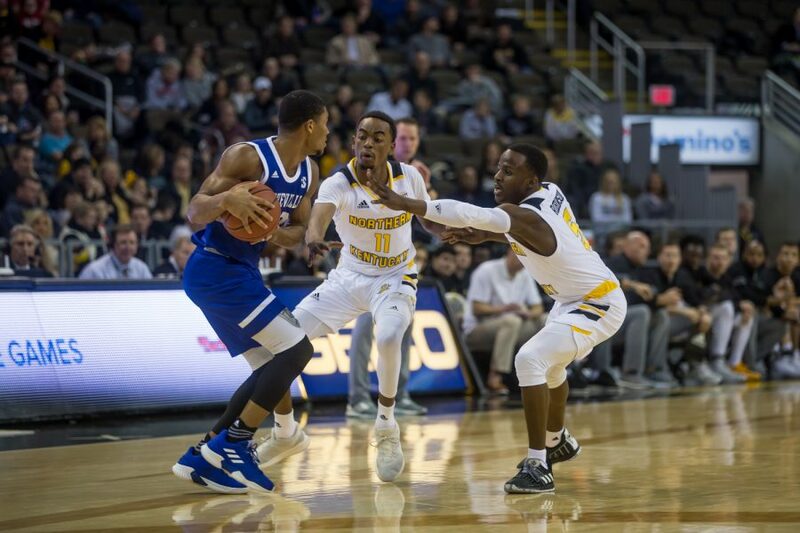 Jalen Tate led the Norse with 16 points, five assists and three rebounds, while Drew McDonald produced 14 points and 14 rebounds. Freshman guard Bryant Macoby earned his first college start and finished with seven points and two assists in 28 minutes. Defensively, the Norse forced 27 turnovers; a program high against a Division I opponent in the Division I era and held a 32-13 shot advantage in points off of turnovers. After shared baskets from Tate, McDonald and Dantez Walton, the Norse got off to a hot start and took the early advantage 10-2, just five minutes into the first half. Defensively, the Norse forced five turnovers in the first five minutes of play as well and refused to let up. The Norse held the Bulldogs to only 5 points in the first ten minutes of the half and continued to stretch the lead, 37-19. The Norse maintained a double-digit lead throughout the second half and went on a 19-0 run towards the end of the game to seal the deal. Though the Norse outscored the Bulldogs 44-18 in the paint and secured the rebound advantage 42-27, the bright spot of the second half came from the bench. Up next for the Norse is a 7:00 p.m. showdown with Manhattan on Saturday night at BB&T Arena. The Jaspers defeated Coastal Carolina 55-53, in the opening game of the tournament.